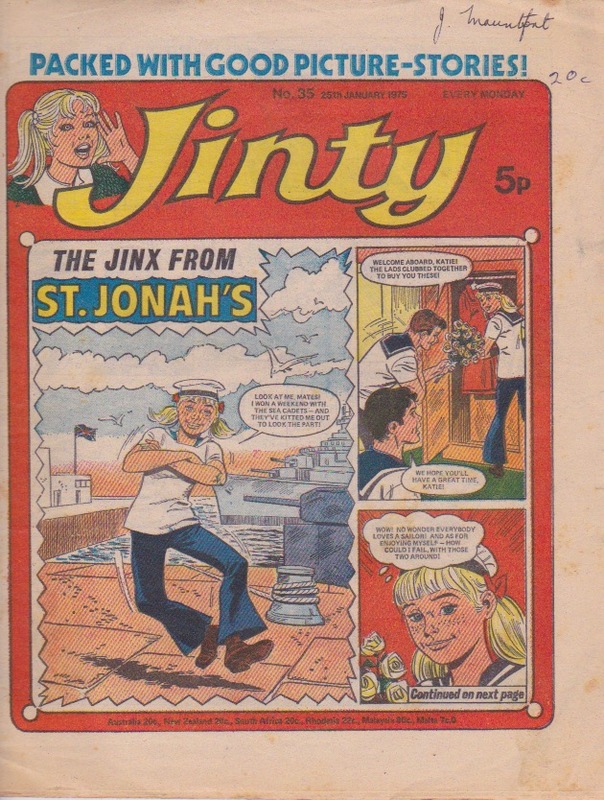 In this issue, Jinty addresses a common gripe from overseas readers – not being able to enter Jinty competitions (because they were several months behind British readers as Jinty was brought out by ship). Jinty has started a competition especially for overseas readers. Katie’s still out sleuthing to clear her father’s name. But her latest suspects look like real thugs! On the other hand, maybe we should feel sorry for them with the Jinx on their tail. It is the final episode of “Wild Horse Summer”. Jed’s hatred for the white mare has been asking for serious repercussions from the beginning, and now he gets it – he has accidentally hit Daphne while trying to shoot the mare! He is so upset that he packs his bags. But his action also has positive results that wrap up the story. Its replacement next week is Jinty’s first Trini Tinturé story, “Prisoners of Paradise Island”. Riches again lure Jackie to carry on with Mrs Mandell as her fake daughter, despite all the warning signs that this woman is clearly mentally unbalanced and danger is imminent. She turns her back on her own family even more now – and not even Mum’s birthday turns her around again. A stray dog is alleviating the misery at Misery House for the girls, who have adopted him as a pet. But the prison authorities are not having that and are out to crush it. Miss Ball tries to shoot the dog, and then she and fink Adolfa try to slip him some poisoned meat. Mouse just seems to be getting even more gullible at readily she falls for Kat’s tricks. Kat has tricked Mouse into being her nursemaid, and then she gives Mouse bad advice in order to trick her into dancing badly for an exam. Ma Siddons wants to put a dog down because she thinks it is savage. When the previous owner from the circus tries to put her straight, she doesn’t listen, so it’s up to Dora’s quick wits to save the dog. In “Always Together”, a bad accident with fire has given Beth a fear of it, which means the children have to find another way to keep warm in freezing weather. And then a new headmaster bans Johnny and other gypsies from the school because he hates gypsies. Jeepers, aren’t there laws against such discrimination? “The Slave of the Mirror” has thrown the mirror over the cliff, but it pops back again to force her to cause more trouble at Scully House. Now it’s making her steal money, and she’ll be in even more hot water if she’s caught next week. It is part two of Katie the Jinx’s weekend with the sea cadets and how the bullying Petty Officer Piggy Porker is taking revenge when he falls foul of her jinxing. But knowing Katie, it will be Piggy who gets sunk in the end. The latest trick that “Slave of the Mirror” has been forced to pull on Major Rose fails, thank goodness. But the mirror is soon up to its tricks again and forcing Mia to play another trick on him. 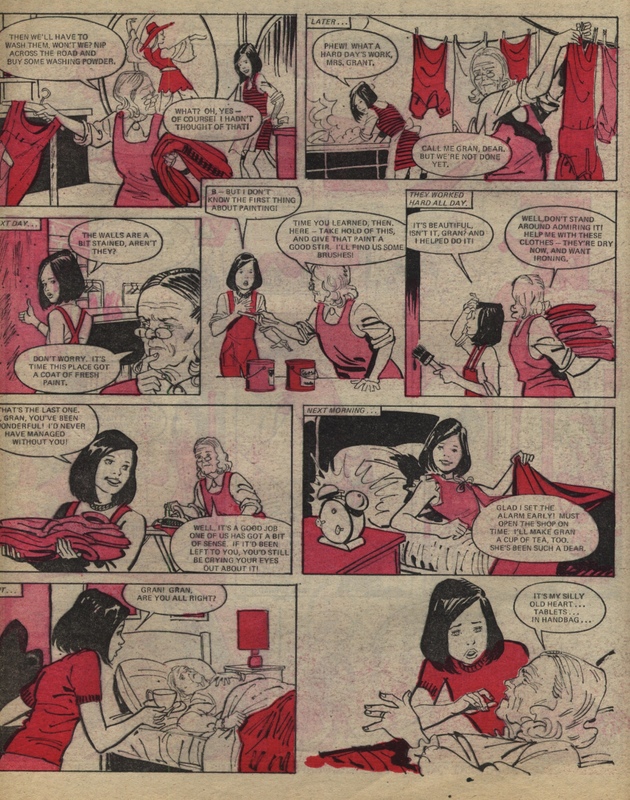 In the penultimate episode of “Jackie’s Two Lives”, Wendy has discovered the full danger to Jackie – the same danger that killed the real Isabella, the daughter she is now impersonating for Mrs Mandell. 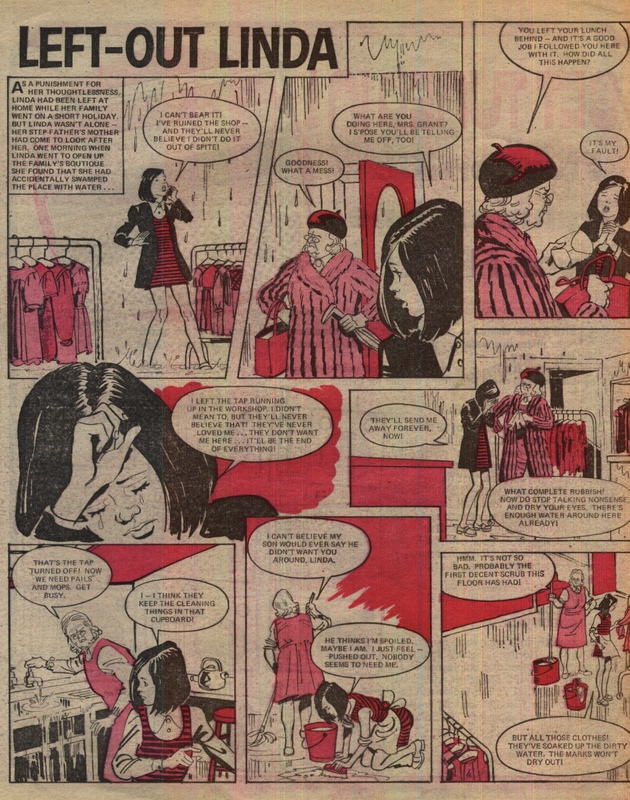 A premonition in a nightmare has given Jackie the same warning, but neither this nor Wendy are enough to break her free of Mrs Mandell’s clutches. Merry is still striking back at Misery House with her resolve to win a hockey match, but the Warden is out to make sure they fail. When they win despite her, she smashes the trophy, just to show how much she hates Merry, and takes no pride or delight in the fact that her reformatory won. Go figure. In “Prisoners of Paradise Island”, Sally is still having no luck in making her hockey players realise what a gilded cage they are in and decides it’s time for a change of tactics. We find out what this means in the next issue, and whether it will turn things around. “Dora Dogsbody” and her dogs demonstrate against Ma Siddons’ mean economics, but a snowstorm is messing it up. The good news is they find refuge with a kindly farming couple. But the farm donkey could pose a problem with one of the dogs, who has been reared to look on donkeys as friends. In the “Kat and Mouse Game”, Kat fears the game will soon be up and is now plotting to get Mouse expelled before she gets found out. Will her “two wicked tricks” next week succeed? A chance of a new life comes in “Always Together” when Dad’s old mate Mr Lawson offers them a new home in Canada. Will they take the offer next week and the story end in the same issue as “Jackie’s Two Lives”? It’s birthday time for “Bird-Girl Brenda”, but Mum forgot to deliver the invitations! The party is that evening and snow is blocking hand delivery. But of course it can’t block Brenda’s flying power. 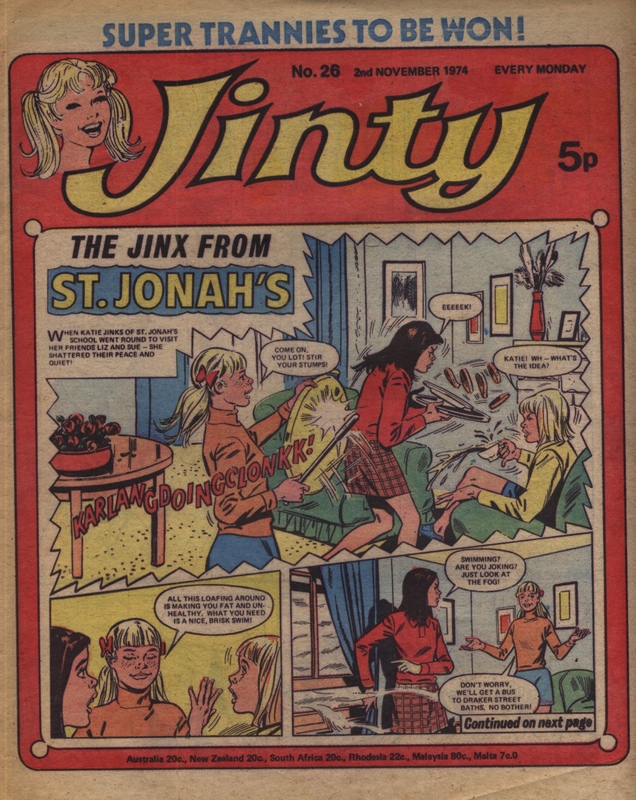 As Comixminx has been doing a run of early Jintys, I have decided to do a few too. Katie the Jinx has won a weekend with the sea cadets. Pity the poor cadets? Not quite – Katie’s jinxing has centred on the bullying Petty Officer, “Piggy” Porker, much to the delight of his long-suffering cadets. By the last panel, Piggy is out for revenge on Katie by forcing her out on a trip on a boat in a rough sea. But the blurb for next week tells us it will be punishment time for Piggy, and we can pretty much guess how. A seaman of a very different nature is in danger of a most undeserving fate when “Slave of the Mirror” forces her to sabotage his boat during a race. In “Jackie’s Two Lives”, Jackie is now living the life of Isabella Mandell. It is the life of luxury Jackie has always dreamed of, but there is no happiness. It is also a living nightmare and misery under the demanding mother who is obsessed with her winning the Princedale trophy. Meanwhile, Jackie’s sister Wendy has decided it is time to do some investigating into Isabella Mandell and discovered that she was driven to her death by the same obsession! The story is clearly now headed for its ending, but where is it going to end with what we’ve seen in this episode? Merry is striking back at Misery House with her resolve to win a hockey match, but the Warden is out to make sure they fail. She does not want her own reformatory to win? Guess it shows how much she hates Merry. In “Prisoners of Paradise Island”, where the prison is such a gilded cage that its prisoners don’t even realise what it is except Sally Tuff, Sally tries to escape. But she doesn’t have much luck. The only score she gets is a cream cake she throws in a jailer’s face. “Dora Dogsbody” and her dogs strike back too, when Ma Siddons’ ideas of economics is to cut back heating, bathing, lighting and food for Dora and the dogs to the extent where they starve, freeze and creep around the dark with candles while the Siddons couple indulge themselves. Dora decides it’s demo time, but the blurb for next week warns us it will be a disaster. In the “Kat and Mouse Game”, Kat’s latest trick on Mouse backfires and she gets stuck in a lift while on her way to an audition. Mouse decides to help by secretly taking Kat’s place in the audition. But it doesn’t look like Kat will be grateful – the blurb for next week informs us that she is going to plot to get Mouse expelled. So the story is building up to its climax too. In “Always Together”, artwork comes to the rescue when food runs low in the wake of Christmas. But the children are in danger of discovery when an old friend of Dad’s turns up. And “Bird-Girl Brenda” uses her flying power to wash windows while doing some other good deeds on the quiet at the same time. In “Merry at Misery House”, Merry is going out of her way to help new reformatory inmate Violet Smith, who in turn has gone out of her way to be unpleasant to all the other inmates… Merry is trying hard to prove that solidarity is the best way of dealing with the reformatory life, but will she be proved wrong by hard-nut Violet?